Shock wave visualization around a circular cylinder with aerospike has been conducted to reveal characteristic of shock pulsation around supersonic parachute. The frequency of shock pulsation has been changed by valuing the ratio of the depth to the diameter, L/D, of the circular model that was valued from zero to two. Pressure history at the bottom of the circular cylinder model was recorded to analyze frequency of the shock pulsation. 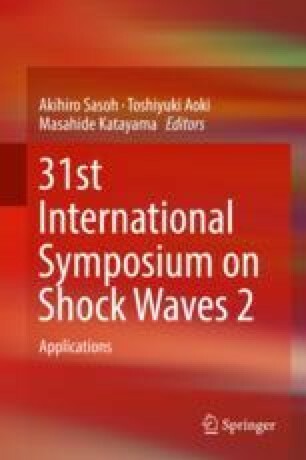 The characteristic of shock pulsation has strongly been affected by L/D in flow with strong disturbance.